We hope this page will eventually contain all the known data about the SU-8 photoresist. Thus, we need your help! Send all your data number 2019, and I will include it in this page, with credits, of course! The SU-8 is a negative, epoxy-type, near-UV photoresist based on EPON SU-8 epoxy resin (from Shell Chemical) that has been originally developed, and patented (US Patent No. 4882245 (1989) and others) by IBM. 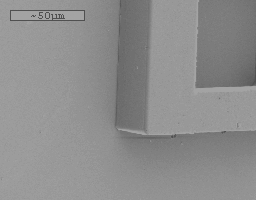 This photoresist can be as thick as 2 mm and aspect ratio >20 and higher have been demonstrated with a standard contact lithography equipment (picture courtesy of R. Yang). These astounding results are due to the low optical absorption in the UV range which only limits the thickness to 2 mm for the 365nm-wavelength where the photo-resist is the most sensitive (i.e., for this thickness very little UV light reach the bottom of the structure). Of course LIGA still yield better results but low-cost application will undoubtedly benefit from this resist that is well suited for acting as a mold for electroplating because of its relatively high thermal stability (Tg>200°C for the cross-linked (i.e., exposed) resist). Gersteltec SARL General-Guisan 26, CH-1009 Pully, Switzerland, Tel: +41 (0)79 564 34 23, Fax: +41 (0)21 728 35 83, under the name GM1040, GM1060, GM1070 (the reference are the same as used previously for Sotec Microsystem products) and GLM2060 for a SU8 with nanocomposite filler. Table 1 : Mechanical properties of the SU-8 photoresist. Table 2 : Physical properties of the SU-8 photoresist. Table 3 : Electromagnetic properties of the SU-8 photoresist. Aspect ratio larger than 1:50 has been obtained... but repeatability may be a problem :-) Typical aspect ratio would be 1:20, and 1:25 for good process (picture courtesy of R. Yang). 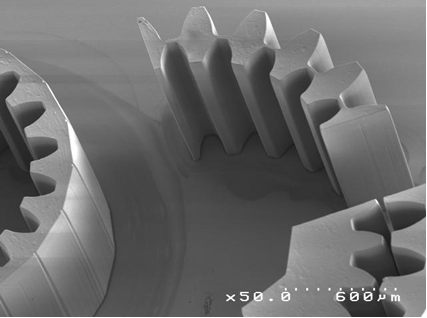 It is possible to perform gray tone lithography with SU8 (see process below). Adhesion of SU-8 is usually good, but depends on the material. The adhesion is worst with gold (Au), average with silicon with native oxide, and best with silicon nitride (SiN) [Frank]. The adhesion of SU-8 seems to be affected by the chemical and SU-8 lift-off with immersion in KOH and TMAH, whereas it sticks with HF [unfortunately no detail available about the substrate]. As adhesion problem are linked with substrate cleanliness, those reports are to be taken with a pinch of salt :-) Finally, MCC with the newer SU-8 2000 series, claims a better adhesion on most materials, due to the change of solvent. Thank you to those who contributed! We have some experience with Al magnetron sputtering on SU8. In order to get a good adhesion there should be a very effective Sputter Etch step before Al sputtering to activate the surface of SU8 [David Ovrokzky] Thank you David!. SU-8 seems to have a good biocompatibility. In collaboration with neuroscientists working in the domain of electrophysiology, they use to culture biological cells on SU-8 and it seems that there is a 'good' biocompatibility of this material. The SU-8 photoepoxy is used as passivation layer for measurement electrodes in the bottom part of a cell culture chamber. [Marc Heuschkel, EPFL]. Thank you Marc! The SU-8 is very difficult (impossible?) to reflow when it is cross-linked. At 210°C it does not reflow after 21h (!) but at 220°C it already changes colour and turns black... [Ren Yang] Thank you Yang! The glass transition temperature of SU-8 after crosslinking is approximately 230°C, but don't expect much to happen [confirming above behaviour which is different from a positive PR]. Because the density of crosslinking in SU-8 is very high, there is not much change in the film after processing, even at high temperatures. Shrinkage will occur to around 350°C with the maximum change occurring before 270°C. After that a 5% weight loss is noted at 364°C with the char temperature being 900°C [Rob Hardman, MicroChem]. Thanks Rob for these additional information! [Christopher Blanford, Oxford] Thanks Chris! I baked cross-linked SU8 to 400°C for 20mins. It turned dark brown, and the center sagged. The structure turned out to be a little less robust. It can shatter if you scratch VERY hard with a tweezers. The CD at the bottom didn't change, but the profile tapered to about 105 degrees. [ShuTing Hsu, UCLA] Thanks ShuTing! 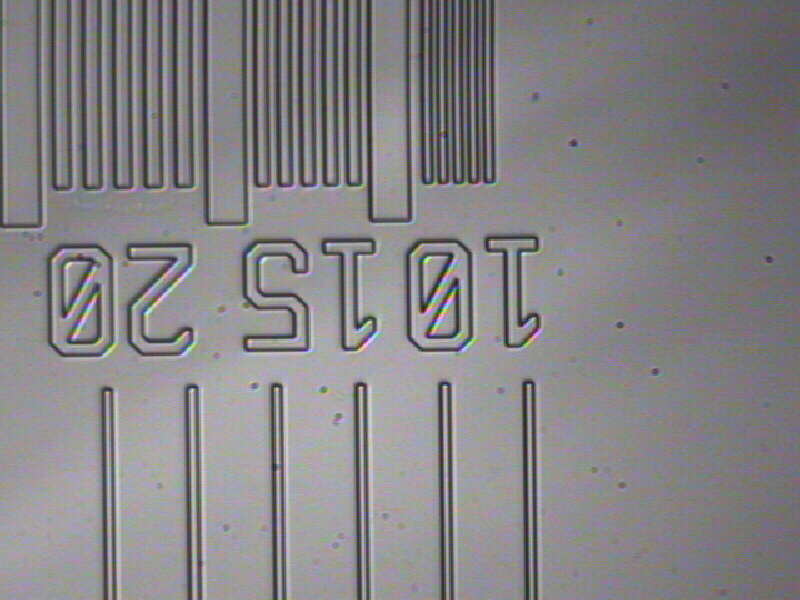 Now defunct SOTEC MICROSYSTEM had compiled a lot of interesting trick about the processing of the SU-8 which are now (partly) available through Dr J. L. Guerin homepage. For example they used to explain that the thin solid crust that is often observed when dealing with thick layer of photoresist, causing loss of resolution, is due to the heating of the surface induced by high dose (200 mJ/cm2) and long exposure time. A way to alleviate the problem is to divide the exposure in 10 to 15 seconds intervals with a 60 seconds waiting time in between. Of course, as with other photoresist, the exact exposure time is shown to depend on the substrate reflectivity, but, in most case, a bit of over-exposure is not a problem here (negative resist). A complete process example with 70% solid resist (equivalent to GM1070) [S. Basrour, J.-C. Jeannot & V. Soumann, LPMO/CNRS, IMFC, Universite de Franche-Comte, Besancon, France, Translated from French: F. Chollet]. Thank you Skandar! Remarks The photo-resist is VERY SENSITIVE to the planarity of the devices used during the whole process (hot plate, UV exposure(?)...) (e.g., reflow occur on the hot plate) and for good results, the equipment has to be carefully leveled. The photo-resist is very hard to strip after cross-linking. The exposed photo-resist soften during hard bake while the non-exposed photo-resist remains hard (?). The side walls are 'very' smooth and 'vertical'. For easier (manual) dispensing pour the most viscous SU-8 (2050+) directly from the bottle. Forget the pipette [Henry Yang, IBM]. A good point Henry! To remove the bubbles and have a nice even coating, place the wafer on a hotplate @ 30- 35 deg C and pour SU-8 2050 over the wafer, wait for a second or two, the SU-8 becomes flowy enough to remove the (bigger) bubbles, remove the wafer from the hotplate swivel the SU-8 across the wafer, then place the wafer on the spin coater and follow your usual recipe [Aarthi Lavanya Dhanapaul, NUS].This trick presumably works with the largest bubble, but it is simple to apply! To avoid streaks on wafers, one method that seemed to work for us was to squeegee a thin layer of SU-8 across the entire substrate. Then immediately add more resist in the center, the usual amount, and spin. A quick and dirty solution, but it worked for us and kept my substrates from looking like spin art. Best of luck to you [Dara Ruggiero, Harris]. Why not Dara! A technique used to minimize the quantity of resist dispensed on a wafer is to pre-wet the wafer with the solvent - not dry completely then dispense and spin. One of the resist companies did some work on it if I recall correctly. You can understand why they would not publicize it much. I don't know how it would work if you have very large topography but it may be worth a try [Avi Laker, Teccor Electronics]. Sounds very interesting Avi! When you apply the SU-8 have the wafer rotating about 20 or so rpm to get a puddle that is centered every time. You may have to change the slow spin rpm for 2" wafers. Also, start the spin cycle at a slow acceleration, say 200 rpm per second [Clifford J. Hamel, Suss Microtec]. Thanks Cliff! Use of high acceleration to ramp up to spin off speed. I know that this is contrary to what some others on the group have said, but the principle of the high spin off makes sense. The reason for the "starfish" pattern has more to do with the surface tension of the resist than of its viscosity. Basically, once a "tendril" of resist has made it to the edge of the wafer, the path of least resistance for the flow of resist is within that "tendril", since the surface tension of the walls of the "tendril" is so high. By using high acceleration (>10,000 rpm/sec, ideally), there is a greater amount of force present to draw the resist outwards on the wafer. Additionally, the rapid acceleration motion breaks up the surface, allowing smoother flow [Chad Brubaker, EV group]. 'Contrary to popular belief' - I like that Chad! Try placing a lid on after dispense before spinning and shut off your exhaust at the same time. There are various valves like one from a company called Progressive Technologies. This will allow the thick resist to spread without loosing too much of its solvent. Use a 400 rpm spread speed and then ramp to the final spin speed for whatever thickness you desire [Bob Henderson]. Thanks Bob! It is observed that the thickness of SU8 film has a tendency to increase after the expiry date on the bottle has passed. This is mostly due to the evaporation of the solvent that makes the resist more viscous and hence thicker. Try increasing the spinning speed or change your porocess parameter to accomodate the larger thickness if you want to avoid problems - of course if you can afford it, use a fresh bottle :-) Another factor affecting the viscosity is the temperature and it may take some time for the PR to reach the temperature of the room as it is usually stored in a fridge. For high aspect ratio imaging, try longer soft bake times in order to reduce the retained solvent level. This may help since you will probably need to have longer develop times. By reducing the solvent level you reduce the risk of exposed resist loss, swelling, adhesion failure, etc. (However, for low aspect ratio structures it is often desirable to work with a bit more solvent, since it speeds up the development time and makes the film easier to strip. )[Scott Heidemann, MicroChem Corp.]. Thank you Scott! it has been reported a few times that the best way to bake the SU-8 (and the `official' MCC way) is to use a hotplate. Although some people have reported success in using an oven it is suspected that the baking from the oven will form `crust' on the SU8 surface that has a low solvent concentration that would slow down the evaporation of solvent in the bulk. With the hot plate the baking from the bottom seems to provide the temperature gradient helping in the diffusion/evaporation of the solvent. For the temperature and duration... ask your witch-doctor! The SU8-2000 series from MCC is using cyclopentanone as the solvent instead of GBL in their standard SU8 and in Gersteltec formulations. This has a significant impact on the backing duration to evaporate the solvent and was the main driver behind the development of this new photoresist. For example for a 100μm thick film the recommended soft-bake time drops from 40mins to 25mins. It is even better for thinner film and a 50μm thick layer soft-bake drops from 26mins to 9mins. The PEB is apparently (and logically) not modified. During soft-bake it has been regularly reported that craters or divots can form on a film which appeared normal after spin-coating. From the report, it is suspected that the origin of the crater is from some surface contamination. the general solution seems to be to better clean (and rinse!) the wafer before spinning. I've read other reports of this happening, and it's happened to me at times as well on glass substrates. We have overcome this somewhat with longer pre-exposure bakes at a lower temperature (85°C). I've also found a prebake of my glass substrates is essential for good adhesion. [Jon R. Fox]. The longer prebake of the substrate is probably helping too... Thanks Jon! Sticking quite often, the SU-8 layer sticks to the mask during exposure (collected by Paddy on the MEMS-list). Even we had this problem of mask sticking. It mainly relates to prebake. We do prebake in a oven (not hot plate) at 90°C for 25 to 30 mins. We leave it for at least 10-15 mins in air before exposing it in the mask aligner. That appears to work alright. We never had the problem of cracking. It appears that the resist is under stress for some reason in your case. You may need to optimise the exposure and PEB times. I had trouble with a ridge all around the wafer, that was thicker and sticky. I had to remove it 'manually' in some cases... but I believe you don't have this problem. With thick photoresist (not SU-8) I used to simply cover the wafer with a half petri dish on the hot plate, the increased baking (ie, IR get reflected) on the resist surface (remember a hotplate bake sample from the bottom) was sufficient to suppress sticking problem I experienced previously. Alternatively, you may wish to try a convection oven for the softbake, it bakes the sample more uniformly. Different people reported what is refered as a T-topping with SU-8 when it is processed with wideband UV source. The reason seems to be in the high absorption of the SU-8 at wavelength shorter than ~350nm, if you use such wavelength, the top layer is strongly exposed (a lot of acid is generated that diffuse), while the bottom part is not. A cure to this problem is to use a filter to cut down the wavelength below 350nm. For example a Hoya UV-34 filter, 2.5mm thick (transmittance: 0% at 325nm, 50% at 350nm, >80% at 370nm and above), was used in a Quintel Q7000 mask aligner, and did provide the very clear following results [Steven Hobson, FraunhoferUSA]. Thank you Steve! Another reason for T-topping may be where amine and airborne contamination levels are not controlled, that may result in surface contamination that get 'amplified' by the photoresist. This seems to be more critical when pattern 1um or below ar targeted. Please contact the reporter if you observed this effect! [Inna Mushkatinskaya, Anvik Corporation]. Thanks Inna! SU-8 absorbs MUCH more at 320 nm than at 365 nm [...] thus 320 nm lasers should not be used for SU-8 exposure, unless it is for very thin layers. [Jacques Jonsmann] Good and valid point, thanks Jacques! When you reduce the solvent level (by using longer soft-bake) you may need to increase your exposure dose. [Scott Heidemann, MicroChem Corp.]. Thank you Scott! Some SU-8 users report that extended PEB times at lower temperatures produce better results than shorter times at higher temperatures. Some even go as low as 60°C in a convection oven. Other suggestions include ramping the temperature up, or starting at a lower initial temperature (around 50°C). The Tg of SU-8 before PEB is about 55°C, the idea is to produce some cross-linking prior to your primary PEB temperature which is frequently between 90-95°C, in order to prevent flowing. You might also consider ramping the temperature down after PEB to reduce stress and cracking. [Scott Heidemann, MicroChem Corp.]. Thank you Scott! Regarding the SU-8, I have developed in acetone, which works just fine for material removal. The biggest issue is that, when drying the acetone, it absorbs so much heat that the temperature of the substrate significantly drops, causing quite a bit of thermal-expansion (or in this case, contraction) stress to the film. It is very likely that any interior corners of your pattern will show evidence of stress cracks [Chad Brubaker]. Thanks Chad! Many SU-8 users have commented that this was their most challenging process step. For high aspect ratio features it is necessary to use medium to strong agitation. 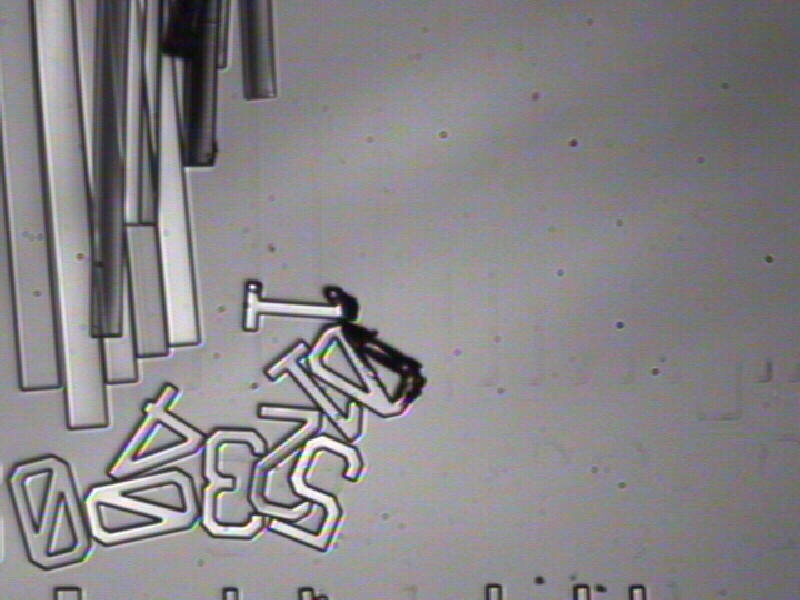 One SU-8 user reported that he actually suspends his wafer on a stir rod and immerses it in a beaker of developer. This gives him the best results (clears out deep vias and trenches). Obviously this isn't a high volume production worthy process, but may be helpful in a lab. Also consider using GBL, the SU-8 solvent as a predip prior to immersion in PGMEA. GBL is more aggressive than PGMEA and may clean up your sidewalls since it will remove partially cross-linked SU-8. I would recommend no more than 2-3 minutes, then go immediately into PGMEA. One word of caution; if you are under cross-linked GBL will chew up your structures. Another idea is to consider megasonics. This technique is commonly used in x-ray LIGA processes and has been reported to work well with SU-8. [Scott Heidemann, MicroChem Corp.]. Thank you Scott! After the prescribed (by a registered Voodoo doctor) development time, I rinse the front and back side of the wafer w/ fresh PGMEA (MicroChem Developer), blow dry the back side, put it back on the spin coater, pool more PGMEA on the frontside and spin dry at 2-3 kRPM for about 15 seconds. You can actually watch as it dries. This seems to do a very good job at removing any excess solvent and thus any suspended polymer [Thomas Long, Georgetown University's Physics Dept]. Thank you Thomas! I'd be interested in hearing more on this subject. We have had no success with IPA or DI water. IPA seems to create white spots, which can not be subsequently removed in PGMEA. IPA may also cause surface cracking due to the high evaporation/cooling rate. DI water seems to be death. Any ideas? [Scott Heidemann, MCC]. Thank you Scott! Since 2008 it seems that the best way to remove cross-linked photo-resist is to use the Muegge (previously R3T) remote plasma equipement. Removal rate may reach 20μm/min (more common rate on full wafer is 4μm/min) by isotropic etching with oxygen radicals without damaging metal or other material on the wafer [Muegge/R3T]. It is used by Mimotec with success since that time and received their prize for "best tool for SU8 removal" [Hubert Lorenz, Mimotec]. Thanks Hubert for the testimony ! The easiest way to remove cross-linked SU-8 is often to lift it off. As such, you can use a cheap sacrificial layer obtained by dissolving a polystyrene sheet in toluene and is removed with toluene. Have a look at the paper below. I have used the Microchem XP-adhesion/release layer [omnicoat]. I have only used it a few times so far but it works well. I noticed no difference with the adhesion (The SU-8 has not lifted up in the few PDMS molds I have made) and when I removed it, the 50 micron features started to lift off after a minute in PRS, and the wafer was clean in an hour of hot soaking [Glen Landry, NRL]. Since 1996 at the EPFL and since 1998 at Mimotec we have tried almost all the solvents you can imagine (also the product of SOTEC) and i can say that nothing works. Mainly the people think they dissolve SU-8, they only remove it from a naked wafer. After plating it's smthg else.... (In our experiment) the SOTEC remover for SU-8+nickel has dissolved 40% of the nickel! [Hubert Lorenz, Mimotec] Thanks Hubert! Now defunct SOTEC microsystem had a serie of liquid removers the SMST-S/M/H that could remove cross-linked SU-8 without affecting metals (the different version S, M or H of the SMST remover depends on the existing metals on the structure, the S version for Cu structure is very slow). A detailed study from Sandia lab among their LIGA related studies explore different ways of removal : solvent (<100°C), RIE (50% O2/50%CF4), molten salt (>300°C) - nothing revolutionary, but may be the best that can be done! Pirannah (H2SO4:H2O2) does attack SU-8 and can be used to strip even severly hardbaked films where solvents fail - if the substrate allows (Pirannah attacks a lot of other stuff as well). Another way to strip SU-8 is plasma containing Hydrogen radicals. We use NH3 as precursor, but pure Hydrogen (e.g. from forming gas) should also work [FB]. Thank you! ashing of the photoresist at a temperature larger than about 600°C leaves very few residue... if the structure can sustain it! SU-8 is virtually insoluble in most chemicals if well crosslinked. You would have to use RIE to etch off the SU-8. However only O2 Plasma does not work well. Try including 'some' CF4 (details not available :-). One thing that was observed is that if you have metal with SU-8 (cured at 200°C) SU-8 is removed without any CF4. Generally you are able to remove SU-8 with O2 plasma and CF4. Then the wafers go through an ultrasonic scrub clean to remove residues.[Paddy]. Thank you Paddy! O2 plasma alone does not work well but by introducing F-radicals (SF6 or CF4) different authors could report etch rate of several μm/min. 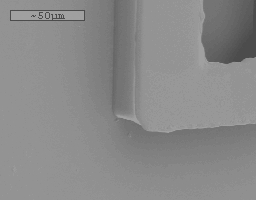 I have etched SU8 (crosslinked) using RIE O2 99sccm [that's high!] and SF6 5sccm with 500W you get around 0.75μm/min. You need the SF6 to help etch the Silane groups that are in the SU8, otherwise you get a surface full of black dots and it is very rough. [Rick Morrison]. And here are some figure to start your process, thanks Rick! Cracking often appears after PEB (collected by Paddy on the MEMS-list). 1) unsufficent exposure dose. Try to expose the layers with increasing dose: 10 mJ - 100mJ - 1000mJ. You will see that the quality of the surface change. 2) the cracks are due to the shrinkage of the SU-8. This effect is increased by exposing large areas of the wafer but if you adapt the design of your mask it disappears. The PEB temperature is an important factor inducing stress and thus resposnible for cracks. The PEB temperature can be reduced to 55°C (instead of the 'official' 95°C) - but of course the PEB duration has to be increased substantailly (see paper). Defunct SOTEC MICRO had a blend of SU-8 with a filler that effectively reduce the coefficient of thermal expansion of the photoresist from 50ppm/K to 21 ppm/K. This brings it closer to the CTE of glass (about 10 ppm/K) and should decrease the stress related to CTE mismatch, thus allow for fewer cracks. I had a lot of adhesion problems and lifting of the SU8 during the development step and finally, the solution, was to ramp up and down all the hotplate steps. This really reduced the stress of the layers and therefore the lifting of the patterns. The hardbake could also induce further stress, I observed it myself! [GARCIA BLANCO Sonia].It is often said but easy to forget, thanks Sonia for reminding! Using SU8 as a mask to etch silicon in KOH usually fails because the KOH is able to dissolve the bond easily. The problem has been solved in some way by M. Larsson using interlocking structure. I've tried AP300 but have seen limited improvements to SU-8/substrate adhesion relative to other forms of chemical adhesion promoter. If you are using HMDS, try to repeat your process but ensuring the wafer is dehydration-baked at 150°C for 20-30 mins after HMDS application and prior to SU-8 spinning. If there is any moisture on the wafer pre- or post- HMDS application, this will hydrolyse the trimethyl substituted groups from the HMDS, reversing the process of silylation. In fact, removal of the HMDS substrate monolayer is achieved by rinsing in water. Applying HMDS in a humid environment worse for adhesion than not using any form of (chemical) adhesion promoter. Blowing nitrogen over your wafer surface (post HMDS) just before applying SU-8 would also be beneficial. [Michael Larsson] HMDS may not be that bad after all... Thanks Michael! increasing exposure dose [Maria Nordström] It has been reported many times, the data sheet dose given is for a certain substrate, mask, etc and yours is probably different - you'll often need a longer exposure time to get good exposure at the SU8/substrate interface a must to have good adhesion. Thanks Maria to point this not so obvious point! A method for fabricating structures in SU-8 photoresist having smoothly varying elevations has been developed at U. of Washington by M. Afromowitz team. Gray-scale structures up to 1 mm in height may be fabricated with one exposure step. Unfortunately the need for non-disclosure agreement prohibits to give detail on the method here, but contact the team with your application they will love it! [M. Afromowitz, U Washington] Thank you Marty! 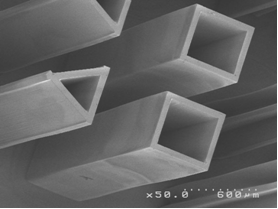 These exceedingly linear SU-8 ramps (transparent in visible light, but opaque in this SEM) have lengths of 2.6 mm and maximum elevations of 0.5 mm (Viewed at 75� from the vertical direction). Here is a list of further links to more information on research done with the resist. Enjoy. MCC is having a whole bunch of application notes (mainly on SU8 removal) and a few reference material on improving and using SU8. If you really want to reach large aspect ratio (up to 100) instead of using UV exposure you may want to use a proton beam using a maskless method. The group of F. Watt in Singapore has developped a whole lot of interesting stuff using SU8 (and other) and a proton source is not that expensive (at least much less than a synchrotron). The MEMS-talk list, is a good discussion group where you can ask for everything you want about MEMS and specially about SU-8. Further very useful information (and the previous one :-) from the IBM and the EPFL teams (and a few others...) may be found in the following papers (please contact us if you know other references - specially historical ones :-) This list was established with the help of Loren St CLAIR, Hubert LORENZ, Arnaud BERTSCH, Marc HEUSCHKEL, Patrick MOUNAIX, LING Zhong-Geng, Stepan LUCYSZYN, SUM Tze Chien, Paul DENTIGER, ZHANG Jun, YANG Ren, TEH Weng Hong and David WOOD (it is available as a BibTex database). Gerstel SA, 19 Ben-Zion, 54286 Tel-Aviv Israel, Fax: +97 23 620 29 13, not only sells SU 8 under the name SU-8 GM-10## with different viscosities (GM 1040, GM 1060, GM 1070) but offers prototyping and mass production of SU8 microsystems based on subcontracting and licensing products. PlasmaQuest RIE equipment removes SU-8 [Paddy]. EV group (formerly Electronic Visions) is a well-known Austrian manufacturer of mask aligner and resist spinner that has developped a complete and very useful set of process condition to be used with their equipment for all SU-8 resist blends, that you should ask for :-) [Loren StClair, Electronic Visions]. Karl Suss is a manufacturer of mask aligners and resist spinner (particularly with a co-rotating cover) working with SU-8 [Scott Heidemann, MicroChem Corp.]. Ultratech Stepper, is an optical stepper manufacturer (they published a few papers on SU-8 processing) working with SU-8 [Scott Heidemann, MicroChem Corp.]. All files on this website are licensed under a Creative Commons Attribution-NonCommercial 2.5 License.